Harry Winston honours its founder with the Legacy high jewellery collection, highlighting an array of flawless diamonds. For all his fame, Harry Winston was a man of mystery. Despite having never been photographed for insurance and security reasons, he gained such international acclaim that the Duchess of Windsor requested an audience with him in 1948, stating that she had heard he had “wonderful things”, referring to the exquisite diamonds, sapphires and emeralds he collected. Through his hands had passed some of the world’s most beautiful stones, including the mythical Hope blue diamond that he would later donate to the Smithsonian Institution in Washington, the 94.80-carat Star of the East, the 41-carat Dresden green diamond, the 726-carat Jonker, the 69.42-carat TaylorBurton diamond, among others. Today, this fascination for diamonds continues unabated at the House of Harry Winstonas it follows in its founder’s footsteps by purchasing spectacular stones under its new owners, the Swatch Group. In 2013, it acquired the Winston Legacy, a 101.73-carat pearshaped, D colour, flawless diamond for US$26.7m, and a year later, Winston Blue, a 13.22-carat vivid blue, flawless diamond for US$23.8m. Underlining this clear direction is the brand’s latest high jewellery collection, Legacy, which is inspired by the pearshaped diamond of the same name. Within this 22-piece collection is an array of important diamonds that are each internally flawless and D colour. Sixty per cent of the stones in the collection are of Type IIa quality—only 1 to 2 per cent of the world’s output of natural diamonds fall in this category, and are characterised by a lack of nitrogen impurities, meaning that the stones shine with limpid brilliance. Still, it was only once we were able to tear our eyes away from the facetted scintillation of the centre diamond that we truly discovered the overall concept of each piece, further appreciating the virtuosity of the design team and the handcrafting skills of the artisans. Two of the necklaces, Unique and Extraordinary, were designed by Maurice Galli, the last designer to have worked directly with Mr Winston himself, as well as late head designer Ambaji Shinde. The latter created the settings for the extraordinary stones the company acquired, and is often credited for having defined the Winston aesthetic. Galli passed away in 2016, but these two pieces are his tribute to the enduring design codes of the house. They feature a medley of marquise- and pear-shaped diamonds Mr Winston favoured for their ability to appear fluid and flexible, and are set in such a manner that the metal can barely be seen. 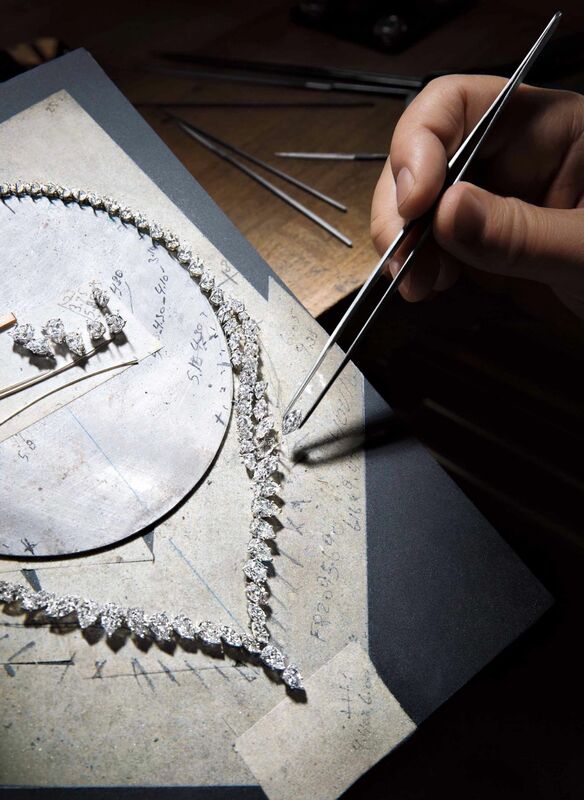 The diamonds appear to be linked as if by a magical sleight of hand—an accolade to the craftsmanship of the jewellery setters at Harry Winston. At the centre of the Unique necklace is a 22.26-carat pear-shaped sparkler, which dangles from a chain of diamonds. Take a closer look, and you’ll notice that varying sizes of marquise-cut diamonds lead into pear-shaped diamonds, finally closing the circle with round brilliants that are punctuated by smaller round-shaped stones. Extraordinary is the necklace that gets the most attention and camera clicks in the brand’s Taipei 101 boutique, where the collection was unveiled in June—here, a 16.16-carat pear-shaped diamond is highlighted by a strand of pear-shaped diamonds that resemble a scalloped edge. It’s a romantic and an unusual take on the typical eternity diamond necklace. So meticulous is the craftsmanship that you would be hard-pressed to spot the platinum between the stones. By celebrating the spirit of its founder with the Legacy collection, Harry Winston makes a dazzling return to its roots with a distinct focus on the stars themselves: the diamonds.